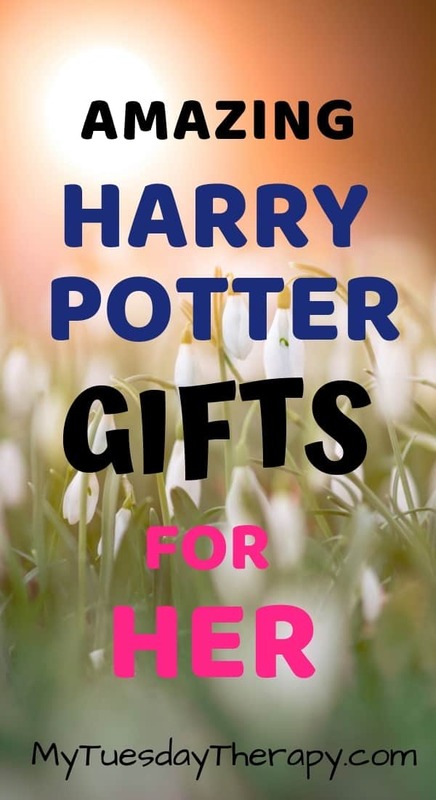 Looking for gift ideas that are fit for a Harry Potter loving muggle? With these Harry Potter gifts you can make your favorite Potterhead’s day magical. 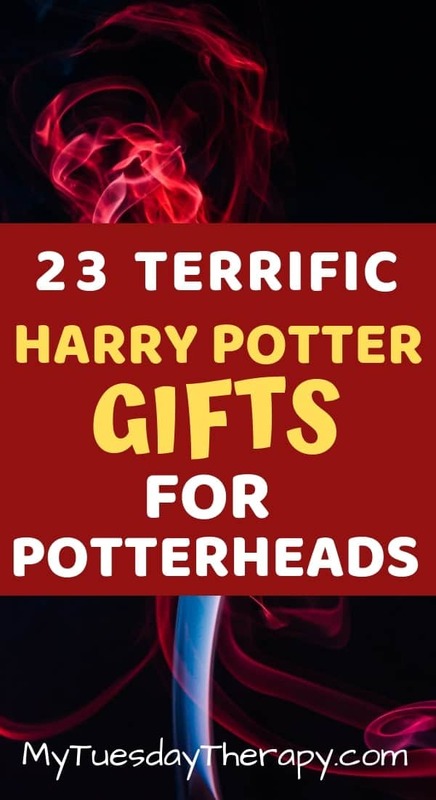 Any Harry Potter fan would love these gifts. 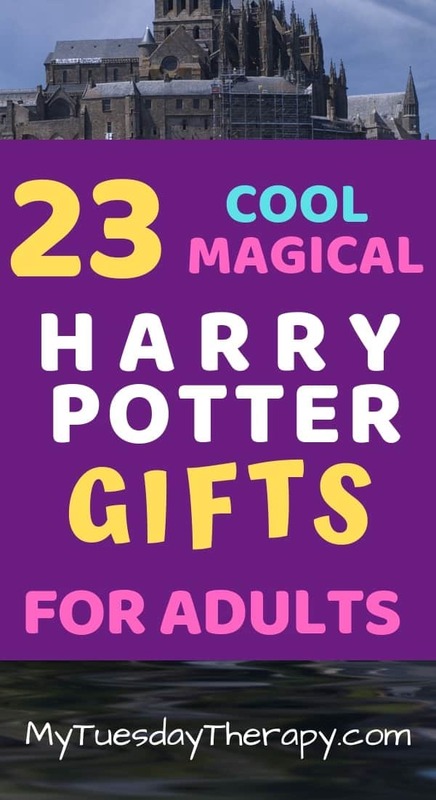 This list has gifts that work for teens and adults too. This beautiful keepsake box from CDS Crafting is perfect for all the beloved treasures. You can choose the symbol for the lid from several options such as Hogwarts Crest, the Deathly Hallows symbol or a House Crest. The rustic looking Keepsake Box comes in two sizes and will surely be treasured by a Harry Potter Fan. Picture your special Potterhead enjoying morning coffee from this gorgeous handmade tumbler from the Three Little Cubs. Choose the size and have the tumbler personalized with the Harry Potter fan’s name. She will love this Just a Wizard Girl Hoodie from Simply Lush. It comes in seven colors from peach to royal blue. The beautiful soft, cozy fleece hoodie will keep her warm. Throw a special Hogwarts Feast to your favorite Harry Potter fans. You’ll love the ideas in the Harry Potter Party on Small Budget. Check out also the various Harry Potter themes from Shopping in Diagon Alley to Dancing in the Yule Ball. Spend quality time with your muggle and work on this 875 piece puzzle together. This is a 3D puzzle of the Hogwarts Astronomy Tower. You can also find cool puzzles featuring The Great Hall, Hogwarts Express, and The Diagon Alley. Beautiful Marauder’s Map Blanket from Baby Booger Bear comes in various sizes suitable for babies and adults. It is a fabulous soft, handmade blanket that can be made with a flannel middle layer for extra warmth. Wrap it around you muggle baby or give it to a Harry Potter fan to snuggle under while reading about Harry’s adventures. This gorgeous Canvas of Hogwarts made by Wall Stickers 2017 will look amazing on the wall. The Hogwarts Castle looks so warm and inviting. He’ll be happy to display it in his home. It comes in various sizes all featuring the magnificent Hogwarts Castle. Don’t you just want to jump in the picture and explore the secret corners of the castle. Harry Potter gift basket loaded with yummy treats like chocolate wand and gummy creatures will delight the gift receiver. You could also make your own magical Harry Potter treats and deliver those in a cauldron or basket. Gryffindor values courage, chivalry, bravery, and nerve. Ravenclaw values intelligence, creativity, learning, and wit. Hufflepuff values hard work, justice, patience, and loyalty. You can get the crest from Up Wood Working also unpainted and paint it yourself! Hot Chocolate would taste amazing from this awesome Ceramic Cauldron. A golden Hogwarts crest adorns this 20 oz mug. 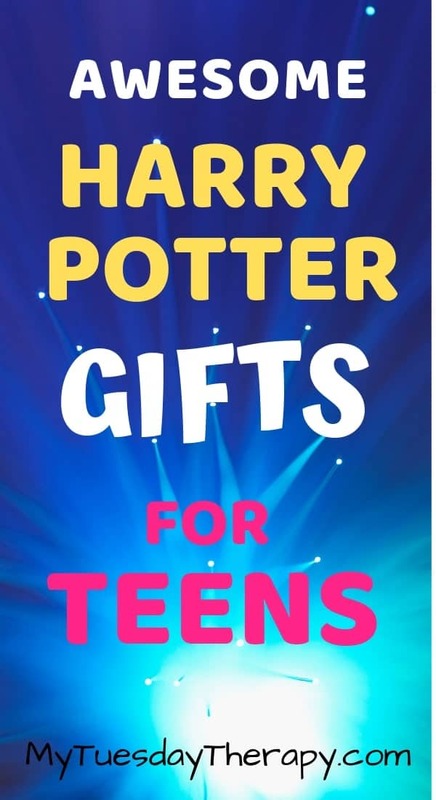 This magical Harry Potter gift for teens and adults is a brilliant choice. So much emotion in that one word: Always. Teens and young adults would love these awesome hand painted Harry Potter themed shoes. The shoes from Soul Art by Unhae are sealed to prevent fading. She’ll love this beautiful, quilted embellished handbag! Adorable accessory from Real Merchandise that will make any outfit sparkle. The Snitch Necklace from Designs By Senofar is perfect for your favorite Harry Potter fan. This snitch has gorgeous sterling silver wings and is pretty for any occasion. A dream come true for many Harry Potter fans. Experience thrilling rides and shopping in the Diagon Alley. Dine in the Leaky Cauldron or Three Broomsticks. Make memories. 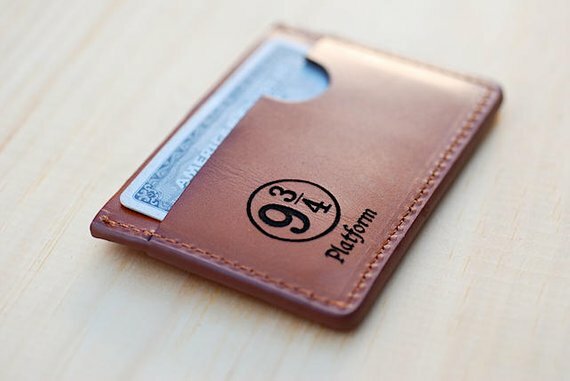 Personalized wallet for him! Handmade leather wallet from Bramble and Beene has place for all the important credit cards and ID. Carry your books, small laptop, water bottles etc in this awesome backpack with Deathly Hallows symbol. Comes in four colors and has wide padded shoulder straps for comfort. Though this replica of Hermione’s Time Turner from Owl Wizard can not help her to travel in time it will be a beautiful addition to her accessory collection. And goes well with any outfit. Enjoy a warm, beautifully scented bath and be sorted into a Hogwarts house. These bath bombs from Heaven Scent Box are made with almond oil that helps to soften your skin. The seller says that the color inside the bath bomb will not stick to the tub but will require a rinse after taking a bath. 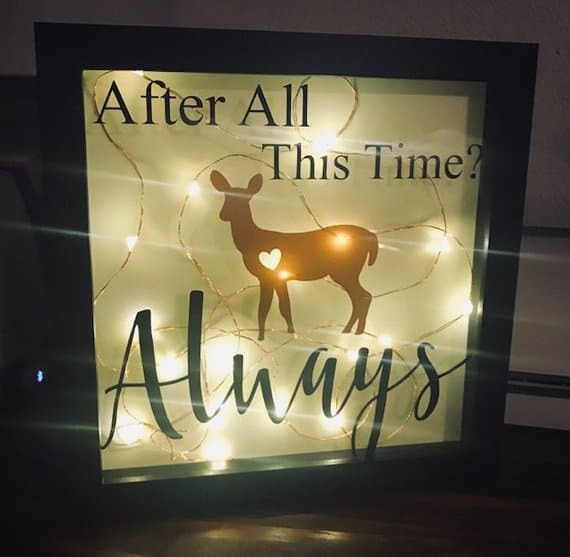 A cute shadow box by Sweet Marleys for your significant other to let him know that after all this time you still love him. Book tickets for a train ride. Put on your Harry Potter themed costumes and go on a train ride pretending you are on your way to Hogwarts. Dance away in this beautiful gown by Phoenix Cardinal at your Yule Ball Party. Made with satin and chiffon you’ll be the princess of the ball. You can choose pink or blue dress. 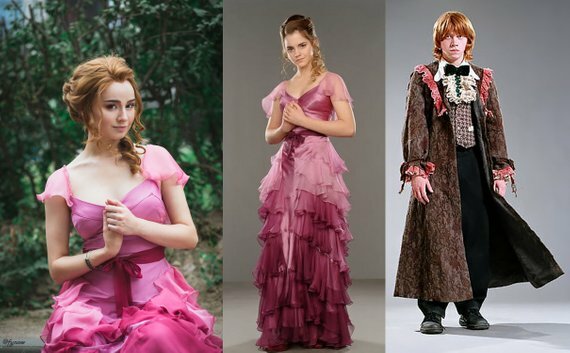 Ron’s Dress Robes are pretty cool too ;). It requires a special person to pull these off. If Dress Robes are not his style how about this comfy sweatshirt from Kish Den with house colors and Hogwarts Crest. 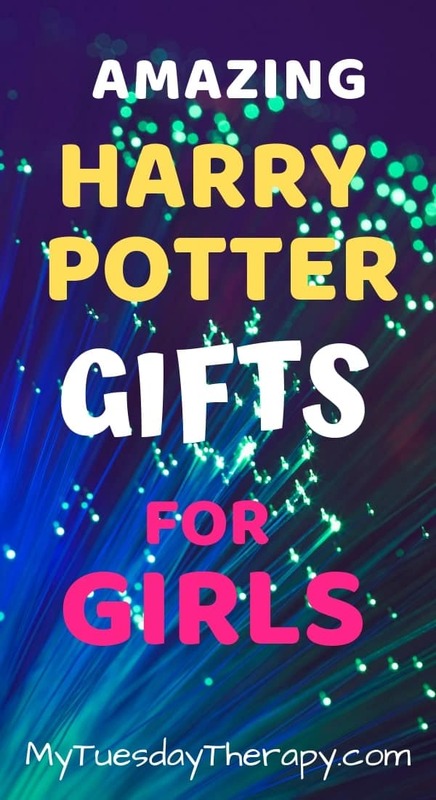 A nice Harry Potter gift for men or women. This book is no ordinary book. The pages feature spectacular 3D guides of the Hogwarts, inside and out. See the Forbidden Forest and Quidditch Pitch, Marauder’s Map and Flying Ford Anglia. This Harry Potter gift will please anyone! Hogwarts is known for their fantastic feasts. 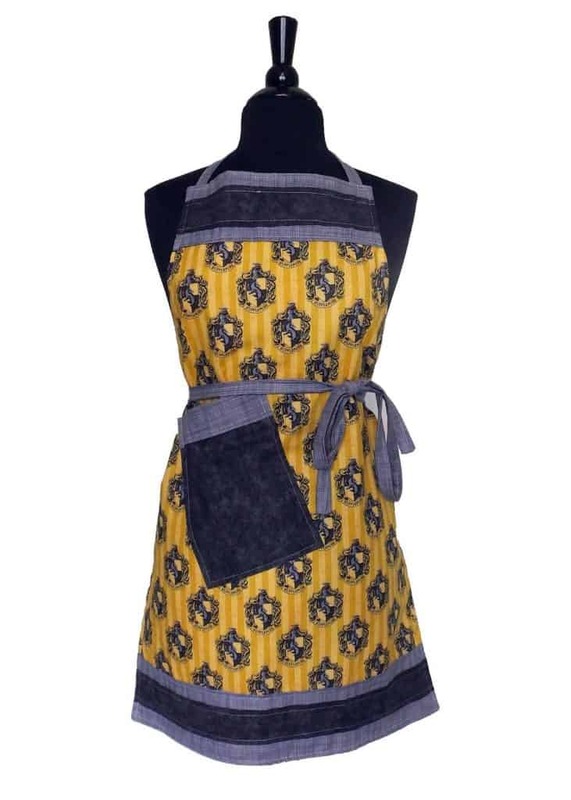 Perhaps your Harry Potter fan would enjoy a beautiful Hufflepuff apron from Trinnyella. She also has one for Gryffindor. A beautiful Hogwarts serving tray that can be used also as a laptop desk. It can be customized with a specific quote! Serve Harry Potter food from this tray at your magical Harry Potter party. Or put it against the wall on a shelf as a pretty decor. Get yours from trschank and bring a little magic to your home… or give it as a gift. 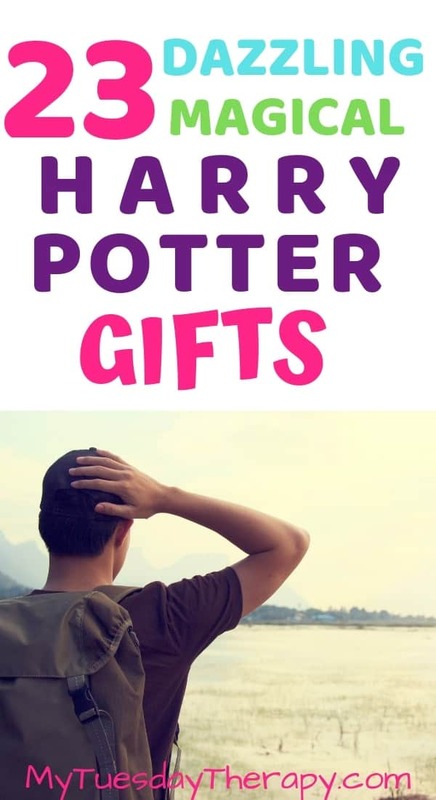 I hope this Harry Potter gift list inspired you and you found exactly what you were looking for. Join My Tuesday Therapy Subscribers and have party and activity ideas sent to your inbox!